A sketch of a Great Ape, drawn by 'YR'. The Imga, or Great Apes, are native beastfolk of Valenwood. These intelligent apes are said to have flourished in Valenwood long before the Aldmer ever arrived there. They cohabit in the forests with the Bosmer tribes, and also inhabit many of the abandoned human trading posts which had been established during the Second Empire. The most notable Imga was undoubtebly Marukh, a First Era prophet who rose to prominence during the Camoran Dynasty. His teachings sparked the massive cultural and spiritual movement known as the Alessian Order. Some Imga see the Altmeri as their superiors and as a portrait of an ideal, civilized society. 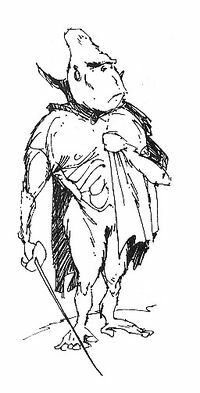 Imga go to desperate measures to emulate the Altmeri: they wear capes, practice with the dueling sword, and attempt to speak with perfect enunciation and courtly manners despite their gravelly, baritone voices. Each individual bears some kind of title, be it Baron, Duke, Earl, or the like, which they use when addressing the members of the Thalmor (but despite what the titles suggest, there are no land-owning Imga). More extreme Imga shave their bodies and powder their skin white to seem more like the Altmeri. The Imga feel that Men are beneath them as lesser beastfolk and pretend to find their smell exceedingly offensive: when Men are around, Imga hold perfumed corners of their capes to their noses. Their reproductive biology is not well understood. In Falinesti, colonies of Imga apes gather Kollopi, an arboreal rodent, from the ends of the slenderest branches of the graht-oaks. The "ape men" are naturally dexterous, and are renowned for their agility. They climb beneath the Kollopi rodents then jump up to "pick" them from their perches. These Kollopi are then used to make a simple peasant dish of the same name. The Imga disappeared from Valenwood circa 2E 582 to wait out the end of the Planemeld and the Alliance War. According to the Altmer author Cirantille, they went to 'visit Falinesti', which had similarly vanished from Tamriel many years previous. However, sometime around 2E 583, there was an Imgan Lich-Queen that ruled over Meirvale in Elsweyr, but she was later defeated by Razum-dar, a well-known agent. It is unknown when exactly the city or the Imga returned. The imgakin is a type of golden-colored monkey, although any actual relationship the breed may have with the Imga is not readily apparent. This page was last modified on 13 January 2019, at 23:54.